On the craft of character, acting, strong women & their influence, & more with Glenn Close's daughter, actress Annie Starke, of The Wife. 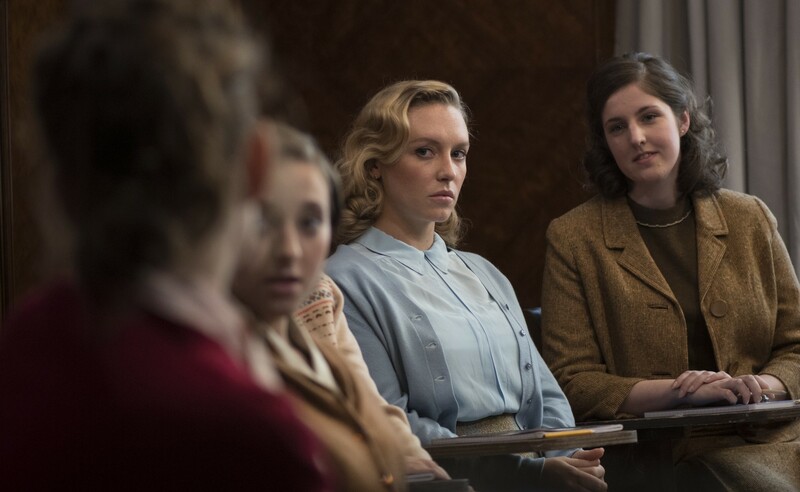 I caught up with actress Annie Starke (Albert Nobbs) for an interview on the craft of acting and character, film, and how her performance as a young Joan Castleman in the upcoming drama The Wife (based on the Meg Wolitzer novel) was colored by her incredible grandmothers, one of whom was a chemist in the 1940s. The Wife is an incredible study in character development, truth, righteous female anger, and just as viscerally, what happens when true greatness is not recognized and is even willfully hidden. In it, Jonathan Pryce is novelist Joe Castleman. Joe is on his way to Stockholm to receive the Nobel Prize in literature and is accompanied by his wife Joan (Glenn Close) who has stood behind him for almost forty years – through thick and thin and some pretty startling levels of intellectual dishonesty. The Wife is at its core a character study of Joan Castleman and all that she goes through in supporting her husband over the years. This study was undoubtedly augmented by the fact that Annie, who is Glenn Close's daughter, plays Joan Castleman at a younger age and an earlier point in her development. Namely, the early days of her and Joe's relationship after they met in college where he was a professor (the very capable Harry Lloyd plays the younger Joe). 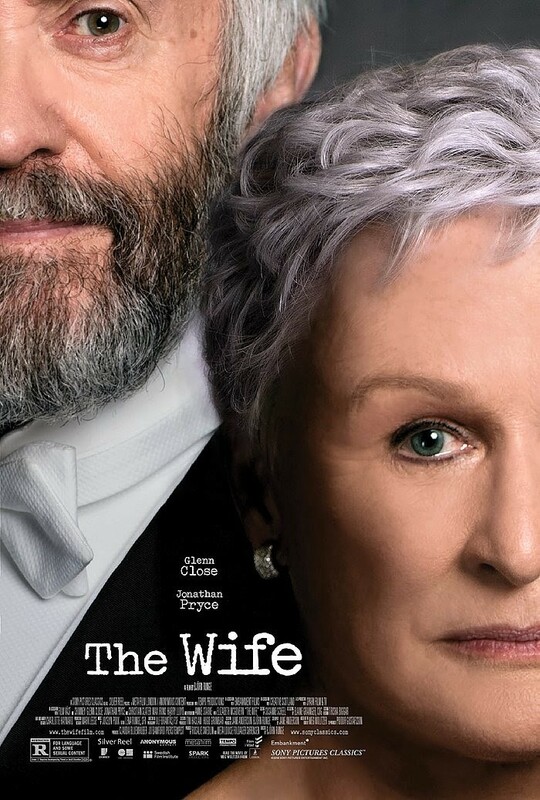 The Wife opens in Los Angeles and New York City August 17th. You shouldn't miss it – it is an intense, incredibly-executed, and engrossing character study with an exceedingly capable cast, very much including Annie Starke, who along with her mother, really steals the show here. Hello Annie welcome to The 405! I'd like to start – if I may – with a question about your history as your mother is Glenn Close. What have been some of the greatest lessons you've learned from her as an actress and artist? Oh wow. You know she's always had a very strong work ethic to put in the time and absolutely the effort. If you are lucky enough to play you better do it to the best of your ability. So definitely I think my work ethic. You know another huge lesson – and it doesn't so much pertain to being an actress – but it's also just a life lesson, work hard, love what you do but also come back and appreciate your family and friends. Always make time for that. That's what makes the world go 'round. Absolutely. Getting right into The Wife, I'm curious, what attracted you to the project beyond your mom also being in it? [Laughs] I see. Yeah, I suppose that kind of dynamic is always pretty intricate. Yeah... I don't think it actually attracted me. I've always been a fan of Joan Anderson. I read the script and I loved it. I loved it – I got like tunnel vision when I was reading it. Then I read the book but what really attracted me to it was having the opportunity to work with Björn [Runge] our director, our ultimate maestro. It was just an incredible experience and I'm so happy that I got to be a part of it. 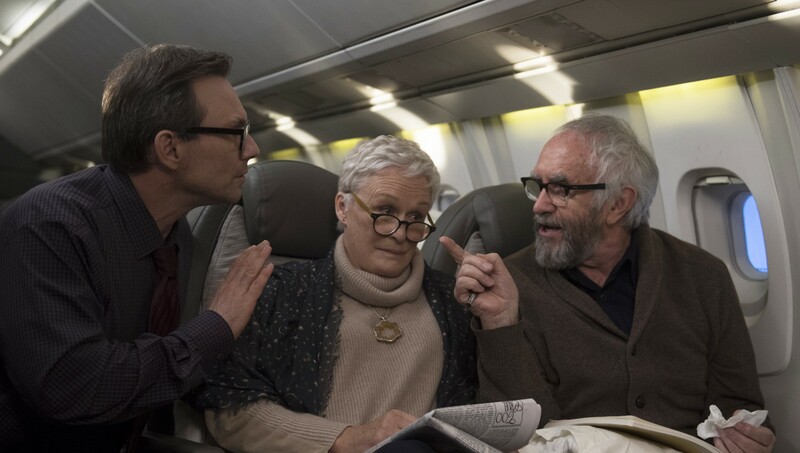 L-R Christian Slater, Glenn Close, and Jonathan Pryce in THE WIFE. The look on Glenn Close as Joan Castleman's face in this still really says it all about her history with her husband Joe (Pryce). It was an incredible film too. I'm curious what did the creative process look like for developing the cohesive total picture of Joan Castleman as a a character, over a pretty large length of time in her life? It was a lot of hours around a table just discussing the character – delving deep into her background and what made Joan Joan – creating a backstory and also creating that middle story because you kind of jump ahead quite a bit in terms of one's lifespan. Yeah, circa 1958 to roughly the early 1990s in the film. So, we also discussed what happened in those thirty plus years that you don't see in the film. It was an enormously collaborative effort. We worked hard on her. We definitely knew what our mission was when we set out. I think that's very much reflected in the capability you and your mother brought to your respective Joans in time and really the whole movie. All the characters are very well-developed even though the film by far treats Joan's development as its main subject. Kind of focusing that question in a bit, what was it like getting into the head-space of the young Joan? In a real sense, this character – especially my character – is a homage to my grandmother. Words were a huge way we like to honor them. They were both two young women who grew up in the 1950s, they were both women of unbelievable intelligence and seemingly endless potential. They both got married quite young and they had families. Of course, as mothers they would say they never regretted the path that they chose but... you know, I used to have – especially with my dad's mom – I used to have these secret little kind of side conversations where I would just be fascinated and enthralled with her career. She was a chemist in the 1940s. Very cool. That kind of example is a really cool thing. And she told me – quite frankly – that she was told she couldn't work anymore when she got pregnant. Also just as a female chemist which was so rare anyway. Yeah. She was definitely told to make a choice and I think that always bothered her. She never outwardly said that to me but I just – I could tell – and it's almost a... joke – it's not a joke but you know it's a subject of conversation... what could've been. Annie Starke as the younger Joan Castleman with director Bjorn Runge of THE WIFE. She sounds like an incredible woman. Can't say I – as a man – know what it would be like hearing that, but I'd imagine it would disturb anyone with an incredible mind and work ethic like her... to be told that. And so arbitrarily. Yeah. This was truly a homage to my beautiful grandmothers. That's fascinating to get that understanding of it with a view to your history too – and how personal that is. What do you hope audiences will take with them from the film? First and foremost, I hope people take away from it that the truth – as difficult and ugly as it can be – truth is what... honestly, I hate to sound like a cliché, but truth is what sets you free. Sometimes clichés are what they are because of their truth. Aside from that, what makes this project so very interesting I think – and I've learned this from discussing this with audience members – is that people are taking from it so many different things. They interpret it on a very individual basis. I think that's so cool to have a project that appeals to everybody in vast and different ways. I think that's both rare and wonderful. So, in a way I totally embrace the ambiguity. Indeed. Some of the greatest art I think has that ambiguity. ...where people will have those different and varied interpretations. Right. The movie also, I just saw it last night, which I hadn't since we saw it at Toronto, and I noticed many things that I had never noticed before. I was deeply affected by – I'm deeply affected by everybody's performances – but you just notice new things whenever you watch it. So, it's a movie that you can come back to, which I'm also deeply grateful for. Absolutely. That kind of touches on a question I like to ask most everyone I talk to, what makes a great film? I think a great film is one that – especially if you're reading the script – is a puzzle. It's one that you figure out not over performing it but as an audience member, and that's what I love so much, again, about this film: how it appeals to everybody on such an individual basis. It's so cool, how it does that in so many different ways – so, I think movies like that make you think and that you can come back to, that you can relate to now and a few years from now as well. Annie Starke as the younger Joan Castleman in THE WIFE. 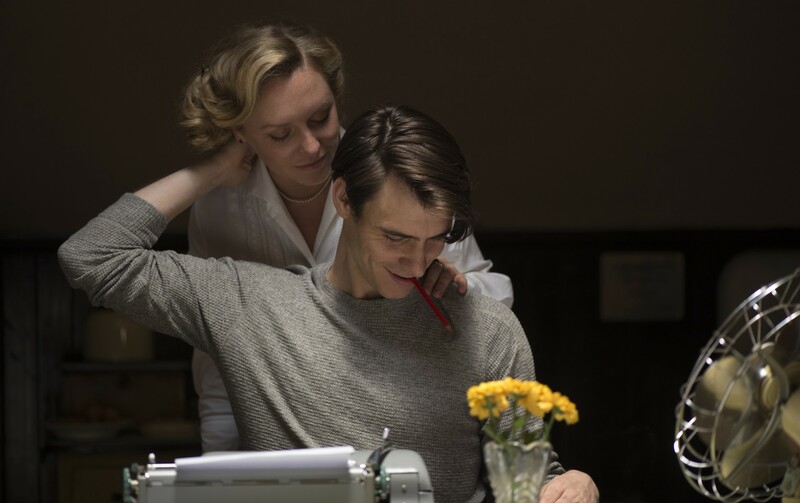 Annie Starke as the younger Joan Castleman with Harry Lloyd as the younger Joe Castleman in THE WIFE. Definitely. That's a fantastic and very true answer. Another question I like to ask most everyone I talk to: favorite films and performances? Which ones have really stuck with you throughout the years and influenced you as an artist? [Laughs] Big question, I know. Yeah, that's a big question. My mind immediately went to To Kill a Mockingbird. That movie deeply affected me. Yeah, I always have to come back to that film. I do. I was just thinking, to bring in a wonderful co-star, Jonathan Pryce in Brazil is extraordinary. So, that's another one that comes to mind. Our last question Annie, what's next for you?